Half of the genes expressed in a kernel of corn come from the plant producing the ear and half come from the pollen grain that fertilized the kernel. The expression of the pollen genes in the seed makes it necessary to isolate sweet corn from field corn, pop corn, and, in certain cases, from other types of sweet corn. The genes that make sweet corn sweet are all recessive, which means that a kernel of sweet corn must have two copies of the gene (one from the mother plant and one from the pollen parent) in order for the sweetness trait to be expressed. (See Table 1 for a listing of the genes discussed in this article.) Field corn and pop corn carry the dominant starch producing forms of these genes. Consequently, if field corn or pop corn pollinates sweet corn, the starch producing genes from the field or pop corn will be expressed instead of the genes from the sweet corn. Understanding why certain types of sweet corn must be isolated from one another is a bit more complicated. There are two sweet corn isolation groups which can be further broken down into six basic categories and then nine different genotypes. The following is a discussion of the six categories accompanied by Table 2 which details the nine different genotypes available, their advantages, disadvantages, and isolation groups. Normal sweet corn varieties, such as Silver Queen, carry the sugary gene, su-1. The sugary gene increases the amount of sugar in the developing ear. However, the disadvantage of the normal sweet corn varieties is that the sugar is quickly converted to bland-tasting starch after harvest. This is the sweet corn that needs to go directly from the field into a pot of boiling water. The sugary enhancer gene, se, works in conjunction with su-1. The se gene increases the amount of sugar produced in the kernel and also increases the tenderness of the kernel. Some sweet corn hybrids are heterozygous for se. This means that the hybrid carries only one copy of se. 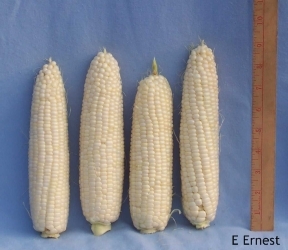 Consequently the ears produced by a heterozygous se hybrid have approximately 75% normal sweet corn kernels, and about 25% sugary enhanced kernels. 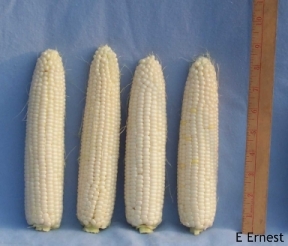 Homozygous se hybrids carry two copies of se, which results in ears with 100% sugary enhanced kernels. Sugary enhanced varieties start out with more sugar in the kernels so they stay sweeter longer (up to a week at 32 – 34°F). However, the sugars will eventually be converted to starch. Some people like the tender, creamy texture of sugary enhanced corn while others would term it mushy. Supersweet sweet corn varieties carry the shrunken-2 (sh2) gene. This gene causes very slow conversion of sugar into starch. Consequently, hybrids that carry sh2 maintain their sweetness for a long time, up to 21 days when cooled to 32 – 34°F. The kernels of supersweet corn are described as crisp by fans and tough and watery by detractors. Because even the mature kernels of supersweet corn do not contain much starch, plantings are more difficult to establish. Seed should be handled with care and soil conditions should be as close to optimum as possible (soil temperature at least 60°F and adequate but not excessive moisture). Some supersweet varieties do not carry su-1. Instead they have the dominant form of the gene, Su-1. If supersweet hybrids are pollinated by normal or sugary enhanced sweet corn the combined effects of Su-1 from the supersweet and Sh2 from the normal or sugary enhanced hybrids will produce starchy field corn-like kernels. This is why supersweet hybrids must be isolated from normal and sugary enhanced hybrids. Synergistic sweet corn hybrids carry su-1, one or two copies of se, and one copy of sh2. The combination of the effects of the se gene and sh2 results in tender kernels with very high sugar content. Synergistic hybrids produce ears with a mixture of kernel types. The ratio and types of kernels produced depends on whether the hybrid has one or two copies of se (see the table for details). Because they carry the dominant Sh2 gene, synergistic sweet corn varieties should be isolated from supersweet varieties. A few synergistic varieties have the brittle-2 (bt2) gene instead of sh2. The bt2 gene’s effect on kernel sweetness is about the same as the effect of sh2 and both genes work in nearly the same way. Synergistic hybrids have the advantage of similar seed vigor to the normal and sugary enhanced hybrids. Augmented shrunken or “augmented supersweet” hybrids carry Su-1, two copies of se, and two copies of sh2. 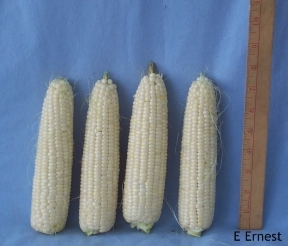 The ears produced by augmented hybrids have 100% tender supersweet kernels, which, due to the combined effects of se and sh2, are tenderer than regular supersweet corn. The tender supersweet kernels are appreciated by some, but others prefer the crunchy texture of the supersweet hybrids. Augmented shrunken varieties must be carefully hand harvested because their very tender kernels will be damaged by machine picking. Augmented varieties need to be isolated from normal, sugary enhanced and synergistic hybrids. Additionally, they have the same seed vigor problems as supersweet varieties and should only be planted under optimal conditions. MiraiTM sweet corn varieties carry two copies of all three sweet corn genes: su-1, se and sh2. They have all tender supersweet kernels and, like the augmented shrunken varieties, need to be hand-harvested. MiraiTM varieties also need optimal soil conditions for seedling establishment. MiraiTM does not require isolation to avoid starchy kernels, but, like all of the sweet corn types, isolation from other sweet corn types is necessary for the best quality. View Table 2. A Comparison of Sweet Corn Genotypes here.